Politically, Mussolini wanted the World Cup as a way to promote fascism throughout the world. To the rest of the country, it was a way to promote the sport. To the Italian National Team, it was a chance to prove their worth in front of a home crowd. They were actually still required to qualify like everyone else, the only time a host nation was required to qualify. In fact, this was the first World Cup Tournament with qualifications at all, since there were 32 out of the then 50 FIFA nations who applied to participate and only 16 spots in the tournament. Uruguay, reigning World Champions, refused to participate in order to return the snub of the European teams four years earlier. That made them the unfortunate statistic of being the only reigning World Cup Champions to not defend their title. Actually, there were a number of teams from the Americas that did not make the journey due to the long boat travel. And Argentina, one of the more talented teams, refused to send its best players from its top league, so instead sent a team of B & C players. England were still snubbing FIFA altogether, so they also snubbed this World Cup. Certainly the World Cup has come a long way from these humble beginnings, with established and fair protocol, better travel methods, and a literal worldwide tournament that is revered and respected. For qualifications, the 32 nations were divided up into groups of two to three based on geographic proximity. Italy were grouped with Greece, and were to play two legs to determine which team would qualify for the World Cup. Greece, which had only formed its National Team four years prior, was considered the sacrificial lamb so that the host nation would not be disgraced by failing to make the tournament. So in the first leg, Italy won 4-0. Greece forfeited the second leg to avoid further embarrassment, and Italy were qualified in the space of 90 minutes. Mexico had already qualified by defeating Cuba. But from the same region, the United States applied late to participate. 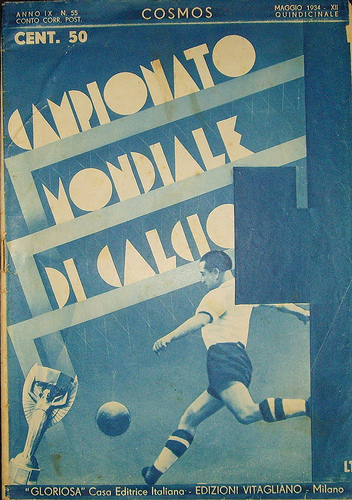 Both teams traveled to Italy, but a single game, held three days before the World Cup in Rome, determined which team would play in the tournament. The United States beat Mexico, taking that 16th tournament spot. So Mexico had made the long journey by boat and weren’t even able to play a single game in the actual tournament. That is one European vacation a footballer wouldn’t want! So the 16 teams who qualified from the original 32 were: Italy, Czechoslovakia, Germany, Austria, Spain, Hungary, Switzerland, Sweden, France, Netherlands, Argentina, Romania, Egypt, Brazil, Belgium, United States. It is notable that 12 of the 16 teams were European, geographically very much the opposite of the 1930 World Cup in Uruguay. And while transportation played a large part in the teams from the Americas not being better represented, sadly politics affected it, too. Italy were one of the favorites going into the tournament along with Spain, Hungary, and Czechoslovakia. 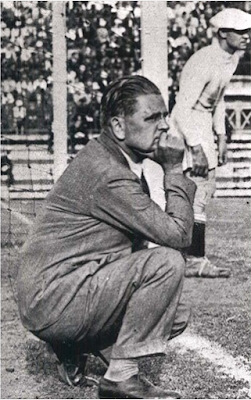 But Austria, coached by Hugo Meisl and also known as the Wunderteam, were probably the favorites. Meisl, a giant in Austrian football, was the inventor of the Mitropa Cup, the predecessor of the European Champions Cup. His Wunderteam only lost three times in 31 games over a three year period going into the 1934 World Cup. This made them the team to fear, or the team to beat, depending on your attitude. The Italian squad were not without their own pedigree and success. Firstly, they were coached by one Vittorio Pozzo. Like Meisl, he was an excellent tactician and a popular coach. He was very superstitious, and had a couple of lucky charms he always relied on. He developed Il Metodo (“the Method”), a formation of 2-3-5, with two defenders and five strikers. Known by others as the Danubian School and widely used in the 1920’s, Pozzo tweaked it to look more like a 2-3-2-3, adding more players to the midfield which was more defensive and more effective on the counterattack. The Oriundi all hailed from Argentina and included: Luis Monti and Attilio Demaria, who had played with Argentina in the 1930 World Cup, Raimundo Orsi, who had won a silver medal with them in 1928, and Enrique Guaita. They were part of a very small group of players that represented more than one nation in international play before the rules were changed. 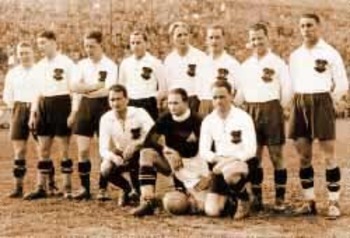 The squad who would represent their country and its dictator in front of a home crowd and on an international stage were: Luigi Allemandi, Pietro Arcari, Luigi Bertolini, Felice Borel, Umberto Caligaris, Armando Castellazzi, Giuseppe Cavanna, Gianpiero Combi, Attilio Demaria, Giovanni Ferrari, Attilio Ferraris, Enrique Guaita, Anfilogino Guarisi, Guido Masetti, Giuseppe Meazza, Luis Monti, Eraldo Monzeglio, Raimundo Orsi, Mario Pizziolo, Virginio Rosetta, Angelo Schiavio, and Mario Varglien. Together, they were the Azzurri, with a common dream of lifting their country’s first World Cup. They were a squad enlisted by a dictator, dreamed up by a coach who hungered for victory, and a squad eager to make their country proud at home. This is part one of a 12 week series I originally wrote for the now defunct Italy World Cup Blog five years ago. The series will now appear here weekly as a tribute to the Azzurri teams of the past.